Welcome to the Artistic Outpost Design Team July Blog Hop! Each month, the fabulous designers at Artistic Outpost showcase projects created with various Artistic Outpost Plates/Themes, this months DT Blog Hop theme is Christmas in July. Artistic Outpost has so many wonderful Christmas plates, it was hard to choose which one I wanted to create my project with for this months hop! 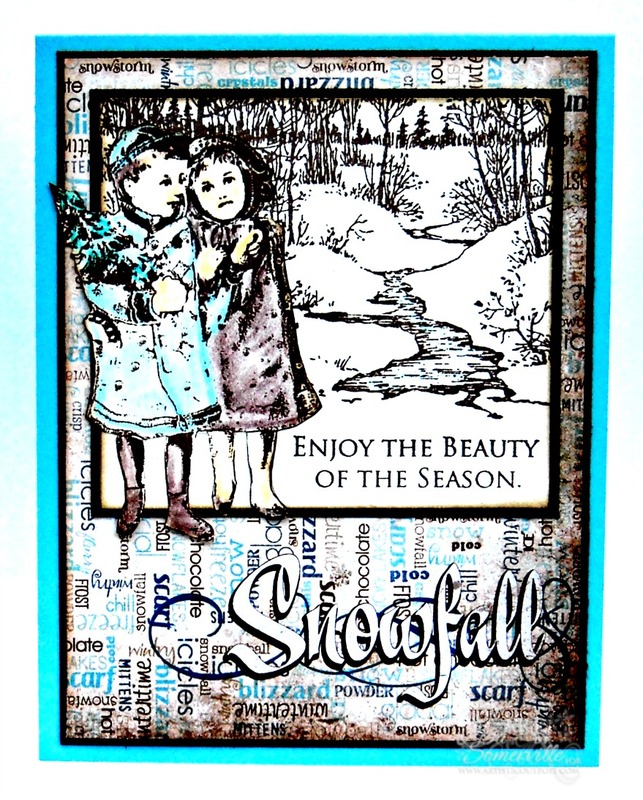 Inspired by the Mojo Monday Sketch, I used stamps from the Artistic Outpost Sleigh Ride and Mid Winter plates to create my card. The scene and sentiment from the Mid Winter plate were stamped in Coffee Archival on Vanilla card stock. The sweet children are from the Sleigh Ride plate, stamped in Coffee Archival on Vanilla card stock, cut out and colored with STAEDTLER Karat Aquarell Watercolor Pencils. I adhered them to the stamped Vanilla panel with Gel Medium. The pattern paper is from the Bo Bunny Snowfall Collection. Looking for more inspiration, be sure to stop by the Designers Blogs to see what they created! Love how you combined the 2 sets to make a delightful scene. I agree that the combined sets are a perfect combination! Love the vintage feel and the girls being offset! Enjoy! So lovely and full of nostalgia! Those little cuties have the perfect amount of color admists the sepia tones. Beautiful card, Lisa. 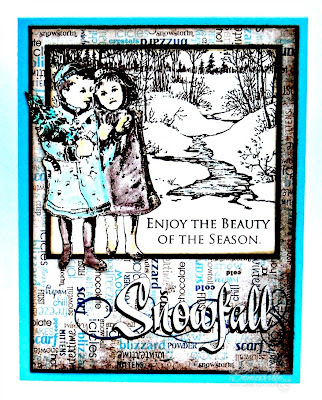 Your color scheme is fabulous, and the children layered on the snow scene is brilliant! Love the script is the background too! Beautiful card! Super scene! Love the way you have layered the children over the woodland background. Great colors and wonderful patterned paper! Lovely card! What a beautiful combination of stamps - the layering is wonderful! Beautiful combination of colors. Love how you placed the kids in front of the snowy scenery. Wonderful card!